Kintoor or Kintur is a village in Barabanki district famous for battle of Kintoor of 1858 during the Indian Mutiny. The Battle of Kintoor was a conflict between rebel sepoys and troops East India Company and Kapurthala State on 6 October 1858 during Indian Mutiny. 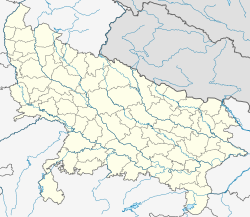 During 1869 census of Oudh, Kintoor was designated as one of the total thirteen large towns or kasbahs and Inspector of Police of Ram Nagar was appointed here on the night of census. Abd ul-Qadir Hanif-ud-Din Kintoori (d. 1789): a Sufi of Qadri order. His ancestors emigrated from Nishapur, Iran, and served as jurists. He was author of the book Kuhl ul-jawahir fi manaqib-i-'Abd ul-Qadir Jilani(1753). Ayatollah Mufti Syed Muhammad Quli Khan Kintoori (1775-1844): principal Sadr Amin at the British court in Meerut. He was author of Tathir al-mu'minin 'an najasat al-mushrikin. Syed Sirāj Ḥusayn Musavi Kintoori (1823-1865): son of Mufti Syed Muhammad Quli Kintoori, he was author of Kashf al-ḥujub wa-l-astār ʿan asmāʾ al-kutub wa-l-asfār, Shudhūr al-ʿiqyān fī tarājim al-aʿyān and Āʾīna-yi ḥaqq-numā. Ayatollah Syed Mir Hamid Hussain Musavi Kintoori Lakhnavi (1830-1880): son of Mufti Syed Muhammad Quli Kintoori author of book Abaqat ul Anwar fi Imamat al Ai'imma al-Athar. Qazi Mahmud Kintoori author of Mirat i Madari. Justice Maulvi Syed Karāmat Ḥusayn Musavi Kintoori (1854-1917): son of Syed Iʿjāz Ḥusayn, he founded Karmat College, Lucknow. Seyyed Ahmad Musavi Hindi: Paternal grandfather of Ayatollah Khomeini. He was born in Kintoor. Parijaat tree a sacred baobab tree on the banks of Ghaghra. The famous Kunteshwar Temple – dedicated to Lord Shiva. ^ GHADEER-E-KHUM WHERE THE RELIGION WAS BROUGHT TO PERFECTION By I.H. Najafi, Published By A GROUP OF MUSLIM BROTHERS, NEW ADDRESS P. 0. Box No. 11365- 1545, Tehran – IRAN. Inextlive Editorial Team (4 June 2014). "आयतुल्लाह ख़ुमैनी का बाराबंकी कनेक्शन (Hindi)". Inextlive.com. Retrieved 5 June 2014. This page was last edited on 10 October 2018, at 15:51 (UTC).